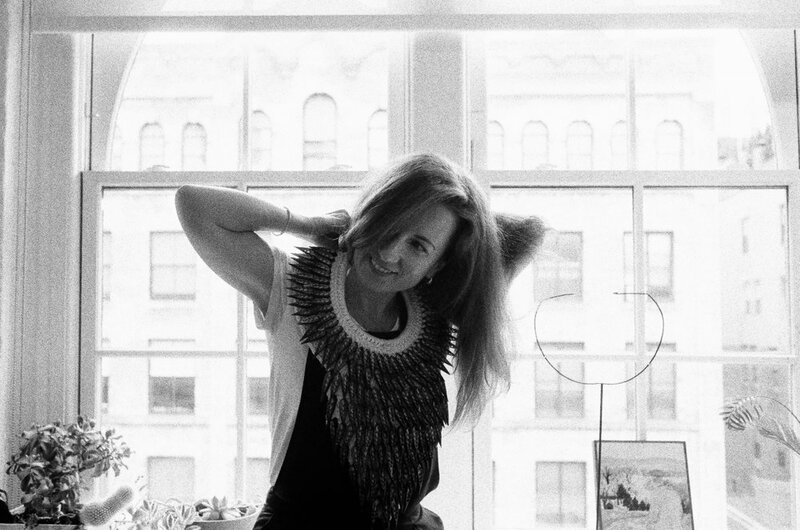 Meet KRISTINA NIKOLOVA DALIO, a New York based writer-director-DP , who talks about her next film, and being on set while nine months pregnant. Kristina, on the rooftop of her home and office in Soho. Born in communist Bulgaria, Kristina Nikolova Dalio grew up in a family of cinematographers. She left home at 18 to study economics at the University of Chicago but ended up getting a BA in film theory instead. She shot first feature film at age 20 and worked for several years as a cinematographer before going to NYU's Grad Film program where she directed five and shot 14 award-winning shorts. Kristina’s directorial feature debut Faith, Love and Whiskey premiered at Slamdance 2012, and went on to win many awards including the Main Jury Prize at the Dallas International Film Festival and Best Debut Feature at the 21st Annual St. Louis International Film Festival, and was nominated for Best Debut Feature by the Bulgarian Film Academy. Next, she shot and produced her husband and collaborator Paul Dalio's first feature Touched with Fire (starring Katie Holmes and Luke Kirby), which premiered at SXSW 2015. Kristina is currently working on her second directorial feature, Amphibia, which is a love story set in a climate-changed world. She currently resides in New York City with Paul and their two children. Kristina Nikolova Dalio: I’ll bring this back to when I was at NYU’s Grad Film program. 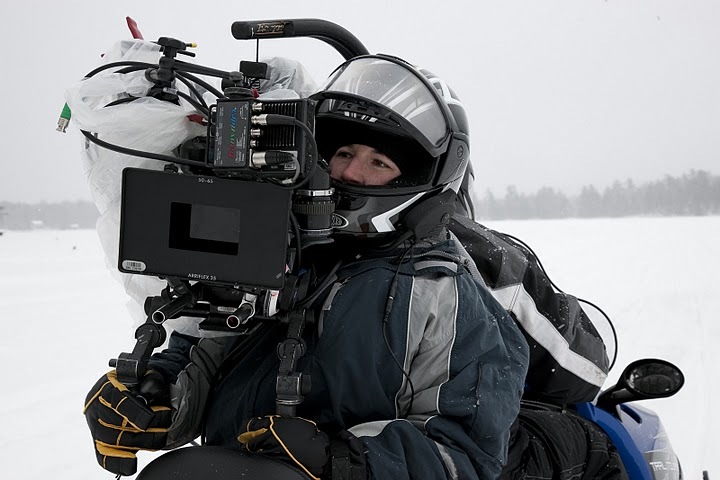 I was DP’ing a film (by Brian Lannin) in the winter in the Adirondacks, in the middle of the night, and for a certain shot, I sat on the back of a snowmobile holding a 35mm camera, going backwards at 20 miles an hour on a frozen lake in sub-zero temperatures. After that, I felt like I could do anything. Kristina, shooting on the back of a snowmobile. What’s something that you would tell your 18-year-old self when you were first starting out? KND: Don’t be a mermaid. That’s it. When I was eighteen, I came to America for the first time, from Bulgaria, to study economics at the University of Chicago on a full scholarship. If I had known how hard it was going to be that first year, I wouldn’t have done it. But that big move changed my life. Also, don't be a mermaid, don’t lose your voice, even for love. In one’s artistic life, there are long seconds or moments that make us stop. There may be an epiphany or a shift. Can you tell us about one of those moments? KND: Recently I was watching The Marvelous Mrs. Maisel and in the last episode of the second season, which is called “All Alone”, it seems like she’s going to have this great career, but her sacrifice is that she will be by herself. Since then, I’ve been thinking about it constantly, that you can have it all, but definitely not at the same time. In my case, I have two children, I have a collaboration with my husband [Paul Dalio], we have a great relationship. I have my career. But things haven’t occurred simultaneously, at the same rate. What was THE film that made you realize you wanted to be a filmmaker or director? KND: I had grown up on sets because my parents were filmmakers in Bulgaria, but I never cared to learn anything about the industry. Then, in college, I walked into a class taught by film professor, Tom Gunning. He started off by showing this experimental film called Tribute to Hell's Angels, which is impossible to find online. He told everyone to make a paper airplane. Then, he turned on the projector light and said, “Now, throw your plane at the screen.” Whoosh! We threw our planes, and soon the paper planes were fighting in the air, amidst the bright white light, and it did look like Howard Hughes’ film, Hell’s Angels. It was so magical, it just took my breath away. So I went back to those classes again and again, and my first degree ended up being in film theory and history, with Tom Gunning as my advisor. I would watch movies all day long in that 35mm screening room. It was incredible. What was a recent film, video or series that you had a really strong, visceral reaction to? KND: Other than the Mrs. Maisel moment, it would be First Reformed, starring Ethan Hawke and Amanda Seyfried, It’s my favorite movie of last year. It builds very slowly to this sublime ending between Hawke and Seyfried, and they’re just amazing. I think it’s the best climate change movie ever made. What is something unexpected that you learned about yourself from making your first movie? KND: I realized that I’m best when I may not know what I’m doing, especially when it comes to improvising and working under pressure. When we would show up to set and an actor challenged the script or wouldn’t want to do something, I would find myself on the spot and have to come up with a solution. I don’t have a very forceful presence and people may lose faith in me when they are under stress, but strangely, this kind of pressure brings out the best in me, and I’m able to reign everyone in while expanding creatively. Still from Faith, Love, Whiskey. As a Director of Photography, what are some of your signature or favorite shots? KND: My favorite or most frequented shot is on a long dolly, passing by things, such as going through a window, heading outside towards mist or falling snow. You grow towards it and then you end with some sort of cinematic moment, something you cannot experience on the page. In Touched With Fire, Paul’s first film, which I produced and co-DP’ed because I was nine months pregnant, there’s one shot in particular that stands out. The scene follows Katie Holmes’ character as she heads into a depressive state. Paul explained that when you’re depressed, it’s like there’s a permanent fog in front of you. So we shot ink dissolving in an aquarium, and we superimposed it on Katie’s face, as she sits down in this scene. I really loved how it looked while it also captured the specificity of the feeling. Still from Touched with Fire. Wait - let’s go back to the “You were nine months pregnant” part. KND: [Laughs] On the last day of the shoot, I found out that the crew had been making bets on whether I’d make it through production. I operated a bit but mostly stayed on the monitor. The film was the vision of three people, Paul, my co-DP Alexander Stanishev and myself. Paul, having gone through being bi-polar himself, had a lot of input regarding the feeling of the shots. Kristina, on the set of Touched with Fire, 9 months pregnant. What’s a movie you wish you had shot? KND: That’s easy: Chungking Express. When I was in college, I walked into a movie theater in Chicago by myself. Afterwards, when I walked out I fell partially in love with the first guy I saw. I literally met him, we had a cigarette, and I thought, I’m in love! Just because of that movie; it affected me so much. I tried to recreate the way it was shot a little bit in Faith, Love and Whiskey. Christopher Doyle is so brilliant. KND: I’m working on my second feature film, Amphibia, which Paul co-wrote with me. It’s a love story set in a world affected by climate change, and follows a young girl and a boy who’s genetically modified to stay underwater for long hours. I call it future-reality, not sci-fi. This is a much bigger movie - in terms of budget and scale. I’ve done the world-building, and been developing the script for the past four years. Ultimately, Amphibia is another love story –– it just takes place in a different world, a future world ravaged by climate change, which is what I care about as I worry about for my children. While it is imaginary, this could be our future, and these characters could be my children. I just hope it comes out before it’s a documentary. KND: I’m going to quote my father-in-law, who always says, “Meaningful work and meaningful relationships.” The meaningful work is what I’ve been doing for the past 20 years, from when I shot my first feature at 18. And meaningful relationships, that’s what I have with my husband, my family and friends. KND: That’s a big question, so I’m going to give you a big answer: Faith, love, and hope. My first movie was called Faith, Love, and Whiskey, because whiskey has replaced hope in Bulgaria. But yes, faith, love, and hope. And you know the mother of faith, love, and hope is wisdom, or Sophia. Please list 8 film scenes or filmmaker quotes that have stuck with you. In Chungking Express, the scene with the girl singing California Dreaming in Chinese and dancing around the guy's apartment she has snuck into. The ending of The Unbearable Lightness of Being when we know their fates, and we see their last night, as they drive into the rain.